The opening night of competition at the 2018 Mel Zajac Jr. International yielded plenty of impressive swims across the board, including some from the likes of Caeleb Dressel, Ryan Lochte and Penny Oleksiak, along with a massive swim from U.S. junior team member Isabelle Stadden in the women’s 200 back. Dressel started off his six event slate in Vancouver with a pair of wins, claiming both the 200 free and 50 fly. He was much quicker in prelims in the 200 than he was a few weeks ago at the Atlanta Classic (1:52.41), and dropped a very impressive 1:48.73 in the final for the win. That knocks his 1:51.96 season best down by over three seconds, and makes him the 4th fastest American this year. 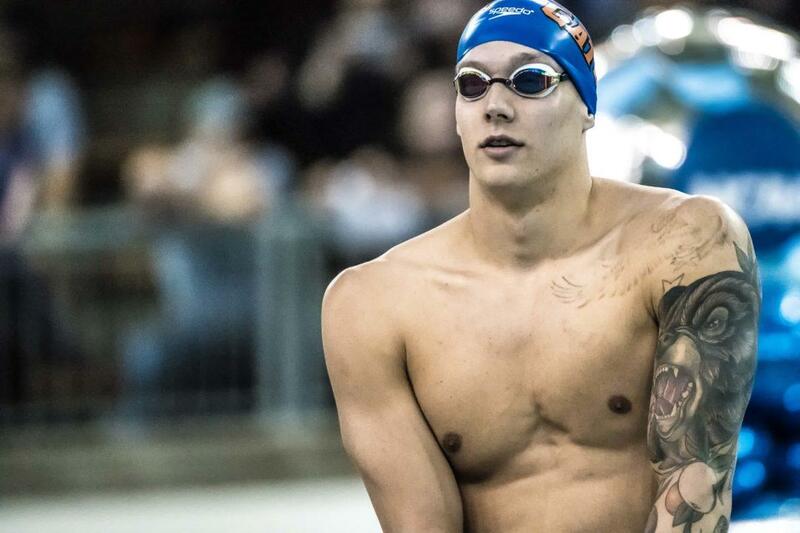 Wearing a Mizuno race suit, Dressel trailed Florida training mate Maxime Rooney throughout the race, but blitzed home in a blazing 26.40 to beat out the 2015 National Champion. Rooney was 2nd in 1:49.84, and their teammate Mitch D’Arrigo (1:50.39) was 3rd, both missing their season bests by mere hundredths of a second. Dressel followed that win up with another in the men’s 50 fly, dropping his prelim swim by nearly a full second in 23.69, his fastest ever at a non-Trials or championship meet. He’s now the 4th fastest American this year behind Jack Conger and Michael Andrew, who are tied at 23.37. Stephen Calkins of the University of Calgary Swim Club edged Sid Farber by .01 for 2nd, 24.51 to 24.52. Rooney won a swim-off at the beginning of the session to get into the A-final, and then placed 4th overall in 24.61. The 33-year-old Lochte scratched the 200 back final after going 2:03.23 this morning in order to solely focus on the 400 IM. After his 4:30.35 prelim in Atlanta, the 2012 Olympic champ was 4:26.55 in the heats before exploding in the final. 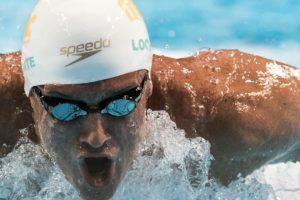 Lochte led from the get-go, producing 100 splits of 58.37(1:04.22)(1:12.93)(1:00.28) to dominate the final and win in 4:15.80. This was a statement swim for the veteran, as he moves into 18th in the world rankings and shows he can be competitive in this event despite his age. Reigning world champ Chase Kalisz is the fastest in the world this year, but Lochte is now the #2 American for the season. Commonwealth Games finalist Tristan Cote (4:22.52) edged out the silver medalist from the Gold Coast, Mark Szaranek (4:24.19), for 2nd in the event, with U.S. junior Jacob Foster 4th in 4:24.80. 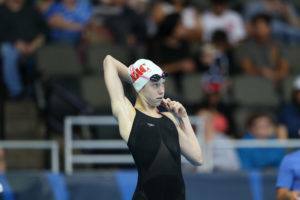 The 15-year-old Stadden dropped a stunning 2:08.37 in the women’s 200 back final, putting her 9th in the world for the season and tops among Americans. She came into the meet with a best of 2:11.17, dropping it to 2:10.39 in prelims and then another two seconds in the final. Her U.S. junior teammate Katharine Berkoff took 2nd, also putting up two best times in one day, finishing in 2:10.55 to become the 6th fastest American in 2018. As for Oleksiak, she won the women’s 50 fly in a very solid 26.59, beating out U.S. junior Gretchen Walsh (27.14) who was 2nd in a new best time. The four-time Olympic medalist also posted the top time in the women’s 200 free, though she did it from the B-final. After a 2:06.42 prelim, she dropped a very strong 1:58.98 in the final, not far off her form at the Commonwealth Games and faster than her 1:59.32 from the Atlanta Classic. Mackenzie Padington won the event in 1:59.01, with 2nd and 3rd place finishers Kyla Leibel (2:01.48) and Walsh (2:02.14) both nailing down new bests. Florida Gator Ben Lawless won the men’s 800 in 8:05.94, his 2nd fastest performance ever, followed by Cascade’s Alex Pratt (8:10.84) and U.S. junior Ross Dant (8:15.56). Markus Thormeyer produced his fastest ever in season swim in the men’s 200 back, clocking 1:58.14 to beat out Florida’s Clark Beach (1:58.58), who notched a personal best. Canadian Olympian Rachel Nicol (1:08.88) won the women’s 100 breast, with 15-year-old Bailey Herbert hitting her 2nd best of the day in the event in 1:09.11 for 2nd. In the men’s event, Jaren LeFranc (1:03.65) used a big back half to run down Jacob Foster (1:03.91) for the win. In the women’s 400 IM, Kelly Fertel established a new best time of 4:44.46 to hold off Padington, who was 4:45.68 for 2nd. Fertel’s Gator teammate Savanna Faulconer (4:47.27) was 3rd, and Herbert had another PB for 4th in 4:50.97. Taylor Kabacy (17:28.25) won the women’s mile over Samantha Zastre (17:34.78). Nice time by Stadden. 200 back will be quite interesting this summer. Lochte looking good in 400 IM. I really wonder what his and Dressel’s line ups will be this summer. Dressel 50/100/200 free 100 fly, 200 IM, 100 beast, 400 hurdles, uneven bars, and And I heard he’s also trying out to replace JR Smith. He literally could do all of em if he decided to. Probably could run a 9.4. Have you seen how explosive he is? You think Bolt is really that much better? Given only two caucasian men in history have even been sub 10 (out of 125), that seems statistically unlikely. Not uneven bars maybe . He’d have to pass thenewly lowered tesosterone levels . Wouldn’t have to try out. The use of “beast” wasn’t even a typo. He’s just gonna get up on the blocks and flex real hard. 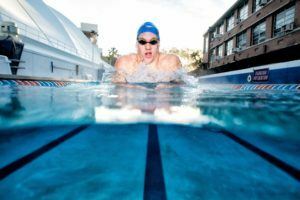 If Dressel can make the same leap in the 200 free as he did in 100 fly last year ?. I don’t know how much to read into it, but 26.40 coming home is faster than what Sun Yang came home in at worlds last year. Why wouldn’t he? He hated not only not being on the relay but the fact that it didn’t win. He’s bout to do something about it. 25.47, 28.39, 28.47, 26.40 for dressel’s splits. Edit: I was blown away by that 1500m but after what came out I have not time for it. He’s done a PB since (200) so I don’t think we can say unequivocally that anything he did before was only due to some US Postal style super doping. Plus, he didn’t take that much off Hackett’s old record. There’s an asterisk, but it was still an amazing swim. It was legal . Who knows who else was on it ? We shall still wait and see whether Dressel, Kolesnikov, Milak and Pieroni can actually become 1:45 or better 200 free guys. You can add Horton to that 200 lineup. He did a PB of 1:45.89 in April without training for it. (he was still training for the 1500) Who knows what he could do now that he’s actually targeting it. Dude’s built like a sprinter anyway so hopefully got big drops in him. I wouldn’t read anything into that specifically… they don’t distribute the medals for the fastest 50 split. But I do think he can make the 4×800 relay for Worlds/Olympics. That would be better than Ledecky’s range! Can Finke/Sweetser/Grothe help him earn a 10th gold? Italy is a huge rival. Great swims for the Gators across the board. They’re going to have a great summer. Maybe they have a little travel taper going on. Not a chance. Troy chartered a specially built jet with an eternity pool and weight room on board. Ain’t no Gators tapering til Gregg says they’re tapering. If by taper you mean missing afternoon practice that day because you had to fly to Vancouver….I agree.